Enjoying a nice dinner at a restaurant for Valentine’s Day with your sweetheart is always special. But for us, it’s just as special to make our favorite dinner at home. 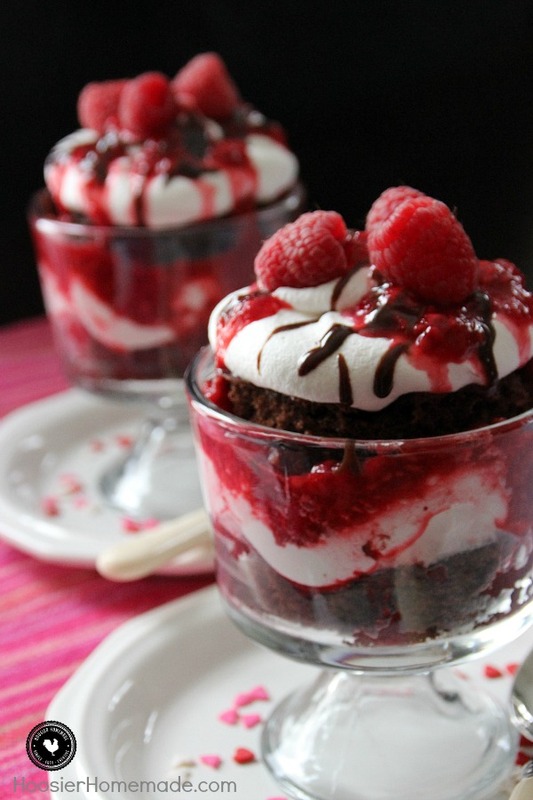 And of course, we can’t forget dessert, especially a chocolate dessert, and this Chocolate Raspberry Trifle makes the perfect Valentine’s Day treat! Have you ever tried adding mayonnaise to chocolate cake? How about coffee? Well, that’s exactly what I did and this chocolate cake is the star of the dessert here. The result? A moist, flavorful cake. And no one will ever know that you added mayonnaise and coffee. Besides the flavor of this cake, the other nice thing is you can prepare all the layers ahead of time, then quickly assemble the trifle before dinner. After the chocolate cake is baked and cooled, you can wrap it tightly in plastic wrap until it’s time to assemble the trifle. The other key ingredient that can be made ahead is the Raspberry Jam. After all the prep work is done, and it’s time to start layering, it’s super easy. 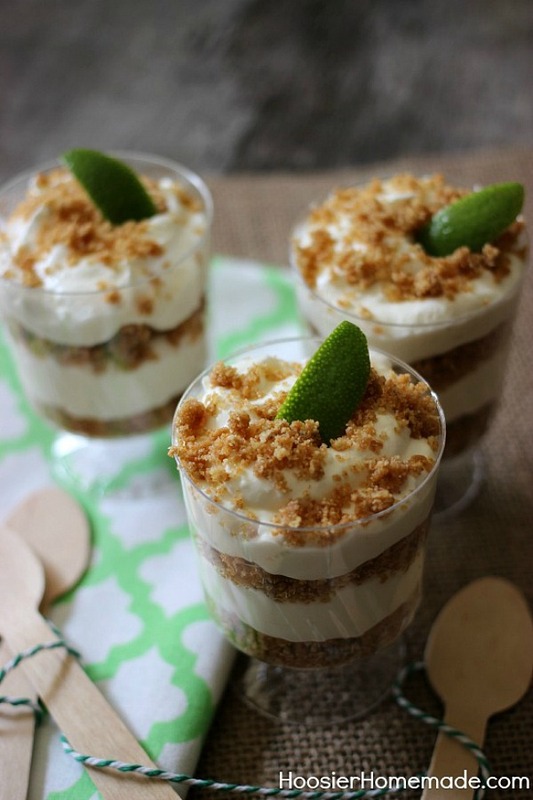 Depending on the size of your trifle dish, you will need a round cutter of some type. You can use a cookie cutter, or like I did a glass. The key here is to choose something that is a bit smaller than the diameter of your trifle dish. Cut out 2 circles per trifle, then start layering. On the bottom is a piece of the chocolate cake to anchor the dessert, then layers of Whipped Topping, Raspberry Jam, and fresh Raspberries. When you add the second piece of cake, gently push down so the layers begin to combine a bit. Then repeat the layers. 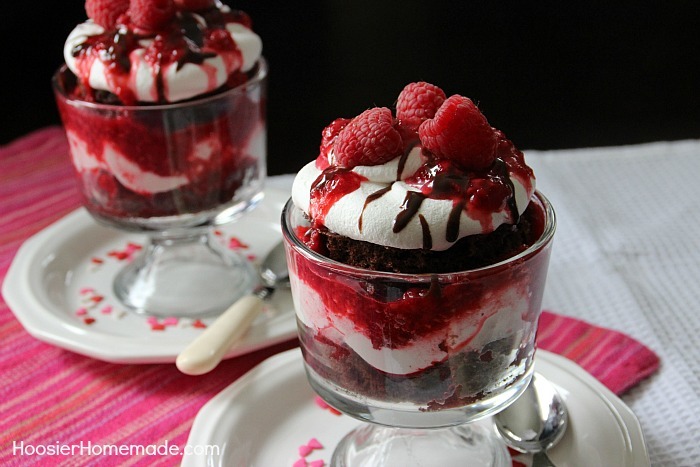 To finish off the Chocolate Raspberry Trifle, top it with Whipped Topping, a drizzle of chocolate fudge, Raspberry Jam and more fresh raspberries. Your sweetheart will love you even more when you serve this decadent chocolate dessert. Shh…don’t tell them it was super easy, they will never know. 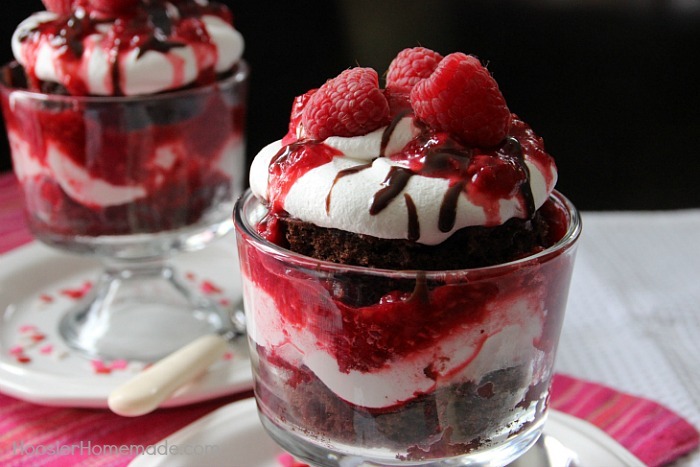 Rich moist Chocolate Cake, covered with Raspberry Jam, whipped topping and Hot Fudge. 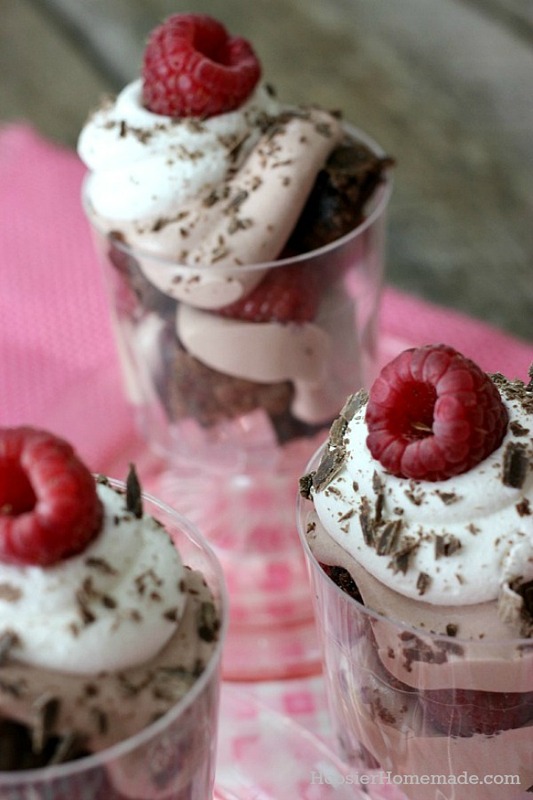 This Chocolate Raspberry Trifle is super easy to make yet it looks impressive! Oh wow. This is one recipe II’ll be willing to learn!